The Who were part of the British Invasion in the 1960s. This is a fun design that reads WHO using elements from the periodic table: More... Tungsten (W), Hydrogen (H), and Oxygen (O). The background of the element squares is the Union Jack, or flag of the United Kingdom. 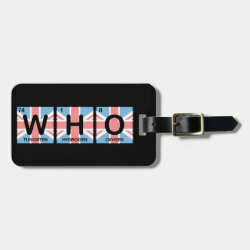 The Who were known for popularizing the use of the Union Jack in fashion at the height of their fame in the late 1960s.